Oil related servicing, spec and product guides, updates pages, help and information. Can you use a motorcycle injector 2 stroke oil as a premix 2T oil (and vice versa)? Differences between 2 stroke premix and injector systems…..
What is a 2T premix system (also known as a Tank Mix system)? A 2 stroke premix system is where you have to mix the 2 stroke oil and the petrol before you use it (normally in a container or in the fuel tank). 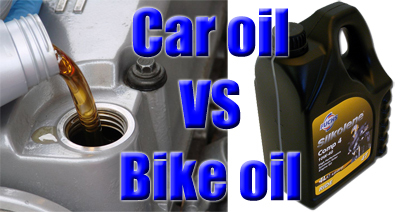 Why can’t I put cheap as chips car oil in my superbike? The answer is of course – you can! I think you will find that cheap car oil will pour into the little hole in the engine as easily as the dearest synthetic motorcycle oil!